Tenggalan fish is geographically distributed through parts of Southeast Asia, more specifically Indonesia’s island of Kalimantan, Perak, Kelantan, Han and Balan Rivers in Peninsular Malaysia. 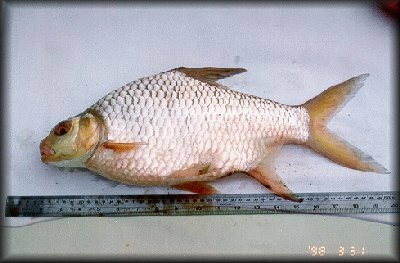 Tenggalan fish is part of the big carp family. It is a mid-water benthic species that can normally be found in large lowland rivers and lakes, coastal rivers and water streams. It engages in short distance migrations; when the water level is high, it feeds mainly on submerged plants and some benthic filamentous algae and micro-organisms that move into from flooded forests and floodplains. It can weigh more than 3kg and surpass more than 50cm in length. The body is diamond shaped, half of its body is green colored whiled the lower part is silver-green colored. It has a lot of fish bones and many of which are Y shaped. The fish meat is fresh and has a rich flavor. Tenggalan fish weighing between 1.5 to 2.0 kg are the best.